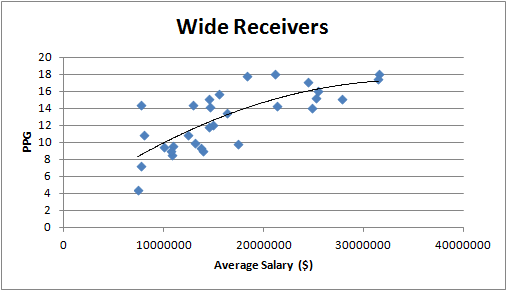 The early RSO auction value examination concludes with the wide receiver position. Receivers offer the most choices among fantasy positions with the deepest group of quality options available. 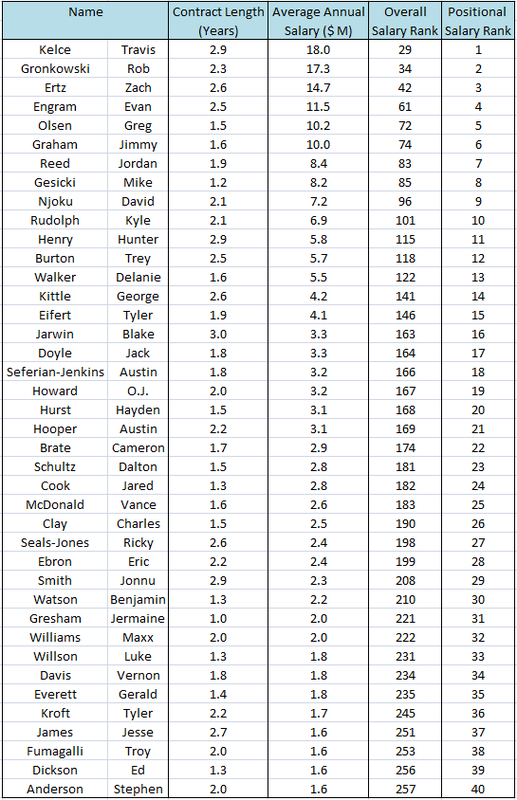 The problem with all that depth is the lack of clear separation in projection from one player to the next, especially as you move away from the top performers. 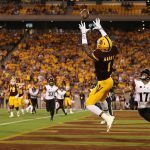 Let’s take a look at some of the top paid receivers in RSO leagues working through some of the good and bad situations to get a better grasp of players for the coming season. The reader may find links to previous articles in the series below in preparation for upcoming auctions. The case for Brown is very easy. He finished inside the top three wide receivers in PPR leagues since every season since 2012. Hopkins garnered 151+ targets each of the last three seasons. Apparently only Brock Osweiler can limit his fantasy success. In case you forgot after an injury ruined his 2017 season, Beckham Jr. has never finished outside the top-4 in PPR points per game. There is more volume competition in New York than ever before with second overall pick Saquon Barkley and second year phenom Evan Engram. Thomas racked up an absurd 52% of the Saints receivers’ targets in 2017 on his second consecutive year with at least 92 receptions and 1,137 yards. That percentage of the pie probably decreases in 2018 but an increase in New Orleans passing volume could balance the effect as the Saints went from one of the most pass happy teams to middle of the pack last season. The inconsistency of Jameis Winston and random nature of touchdowns is in full view when one looks at Evans who scored 12 touchdowns in two seasons and five or less in his other two years. He holds a decent floor with four 1,000 yard seasons to start a career. Allen averages 163 targets, 112 receptions, and 1.396 yards per 16 games over the last three seasons and the Chargers lost potential breakout Hunter Henry already. For whatever reason, Jones has never been a huge touchdown scorer finishing with just three TDs last year. That means a potential discount for a player with four consecutive 80+ catch, 1,400+ yard seasons. 2017 also felt like a disappointing year for Green who saw his lowest standard PPG of his career. 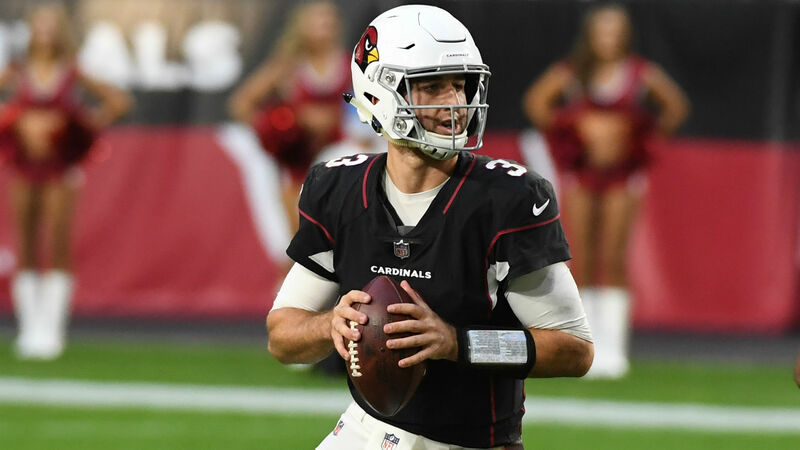 Look for a rebound from Green and a Cincinnati offense who struggled last season with injuries and an underperforming offensive line where upgrades have been made this offseason. Adams scored 22 touchdowns the last two seasons and gets back Aaron Rodgers. This is still a player averaging below 12 yards per reception for his career with no 1,000 yard receiving seasons. Hill might count as the most explosive player in the NFL with six 50+ yard plays last season. 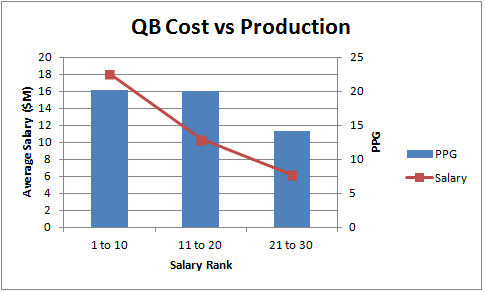 His relatively low volume combined with increased target competition and new quarterback makes for a risky WR1 option. Robinson produced a huge 1,400 yard season in 2015 but the resume is barren otherwise. Uncertainty abounds returning from an ACL-tear with a young QB and unknown role in new offense. Cooks posted three consecutive 1.000 yard seasons with Brees and Brady at QB. No receiver in a Sean McVay offense (Washington or the Rams) amassed a 21% target share in any of the last four years. Thielen and Diggs should dominate targets in Minnesota from new QB Kirk Cousins on what should be a quality passing attack. Cooper ranked just 51st in receiving yards from a disastrous 2017 season despite a monstrous 210 yard game. New coach Jon Gruden gives hope to those looking for a return to Cooper’s promising first two years. 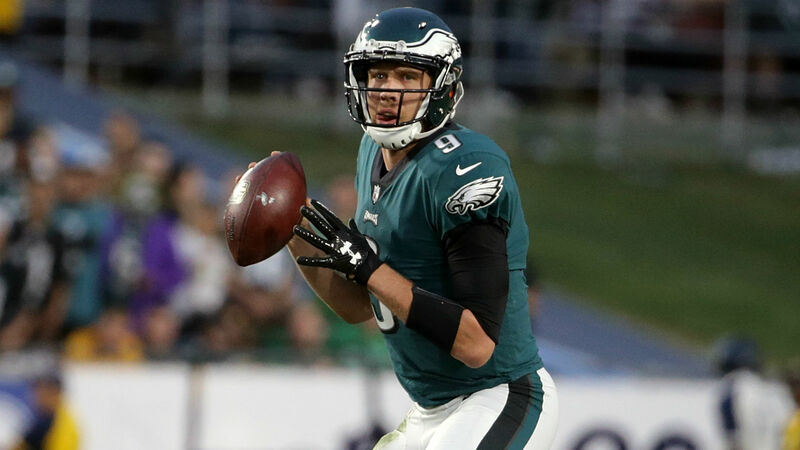 Jeffrey played through a severe shoulder injury last year and might not be ready to start the season but remains one of the top targets in the Eagles passing attack. 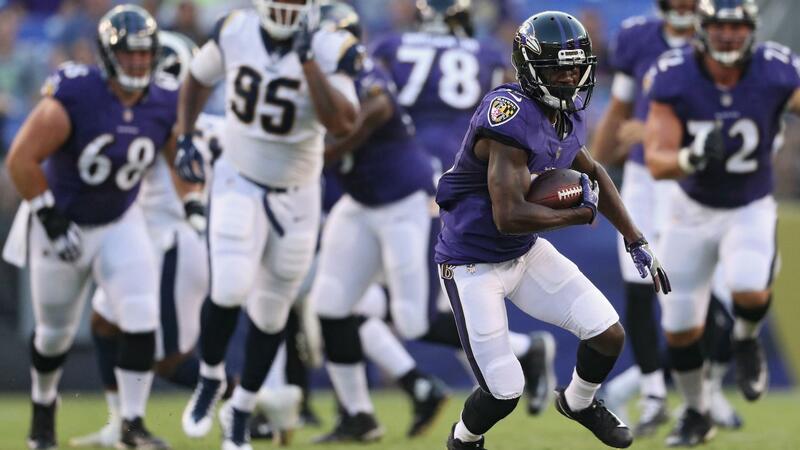 The 21 year old Smith –Schuster impressed his rookie season gaining 75+ yards in 5 of his last 7 games. He remains behind both Brown and Bell for targets in the Steelers’ offense but looks like a quality long-term investment. Baldwin should dominate targets on a depth chart with little competition. Questions surround the Seattle wide receiver going into season with a mysterious knee injury that will keep him from most of preseason. Davis is a popular breakout receiver on a revamped Tennessee offense with new coaching staff. Lot of competition for targets exists on a likely low-volume passing attack in Cleveland where Landry and Gordon will fight for main billing. 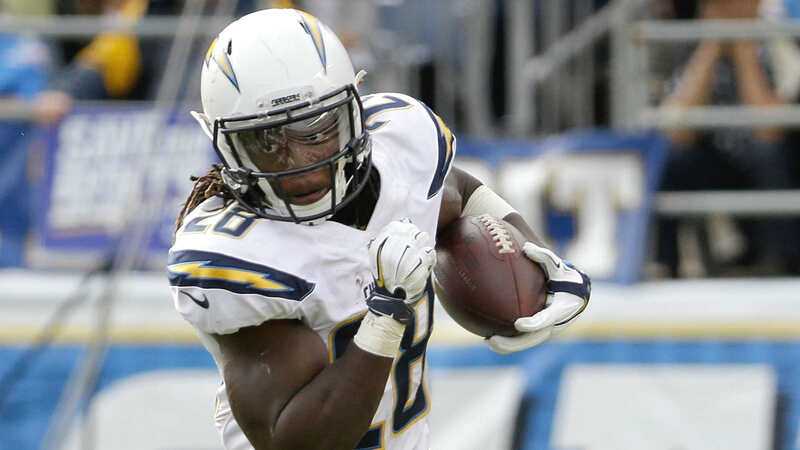 Landry’s prospects increase daily as Gordon remains away from camp. The depth chart in Indianapolis behind Hilton is one of the shallowest in the league. His top-level production possibilities remain tied to Andrew Luck’s health. Detroit boasts one of the most stable WR duos in Tate and Jones on a regular top-10 volume passing offense. Thomas leads the Denver receiving core with what should be an upgrade at QB. Fitzgerald posted 108+ receptions in three consecutive seasons and gets check-down machine Bradford at QB. Kansas City paid Watkins a huge amount to be a big part of the offense but his role is uncertain given the other weapons for the Chiefs. The Rams’ receiving core projects as a three-headed monster with similar target shares for Cupp, Woods, and Cooks. Funchess’ role becomes unclear with the addition of rookie Moore plus the return of Olsen and Samuel. Will Parker take control of a Miami receiving group previously predicated on short passing to Jarvis Landry? Crowder heads a deep receiving group in Washington with lots of talent but injury questions and little on-field production. Is Edelman the same player at 32 after a torn ACL and PED suspension? 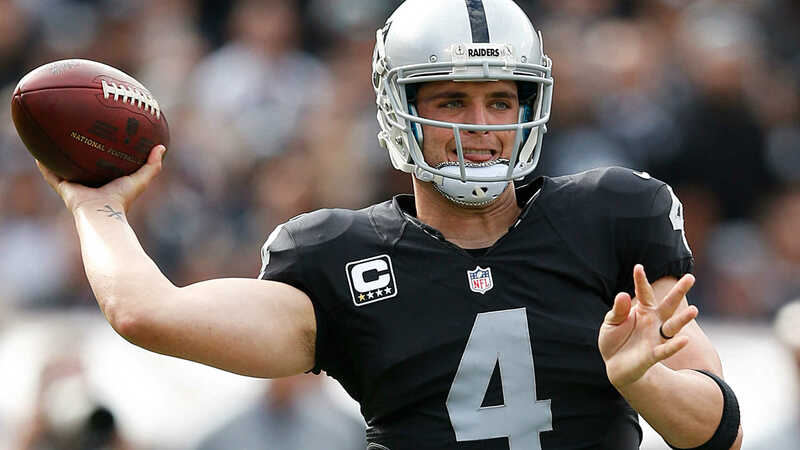 Will Bryant find a meaningful role in a revamped Oakland offense? Benjamin should be a target hog on one of the worst offenses in football. Similar to Benjamin, Crabtree could head the receiving core for a low-upside, Flacco-led Baltimore offense. Nelson goes from one of the most efficient passers in history (Rodgers) to one of the least efficient passers in his time in the league (Carr). An owner can pay WR4/5 prices for Garcon and Goodwin on a projected top-10 passing offense. Anderson is the top receiver for the Jets but could be hit with a suspension at any time. Cobb remains a quality flex option as the WR2 on a Rodgers-led passing attack whenever he is healthy. Questions remain on how long that may be. Hogan (55) is the only returning starting receiver for New England from last year with Edelman suspended to start the year. Sanders (59) suffered through bad QB play and ankle injuries in Denver last year but could achieve near-Thomas target levels. 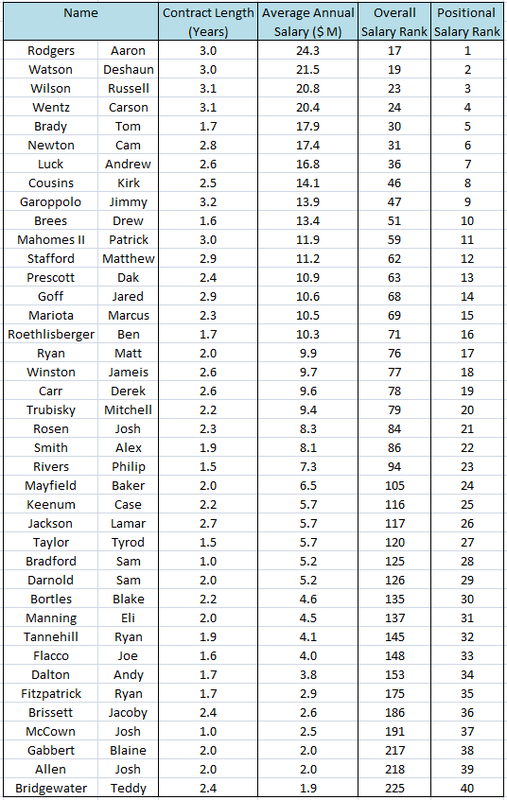 It is conceivable Stills (60), Wilson (93), or Amendola (99) ends up leading the Dolphins in receptions. Lockett (63) flashed explosive play-making ability at times in Seattle and the Seahawk receiving depth chart is very shallow, particularly with questions about Baldwin’s availability. Matthews (68) might still be the number one target in Tennessee with a new, hopefully improved, offensive scheme. Our early RSO auction value examination moves to the tight end position. 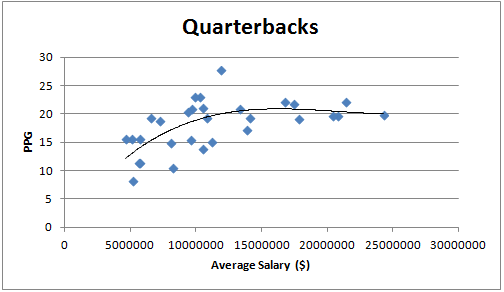 The group is among the least valuable positions in most fantasy football leagues with very few reliable options. What little value exists overwhelmingly resides in the top few options. 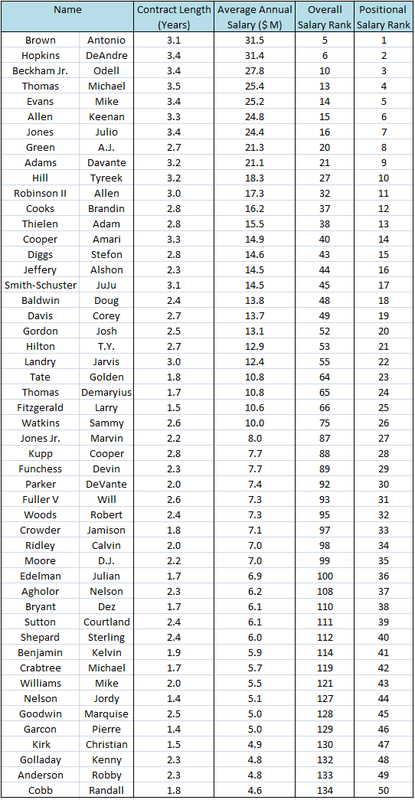 The combined duties of blocking and receiving for most tight ends make weekly fantasy consistency an issue. The NFL has seen an injection of talent at the position in recent drafts, however, and we are left waiting to determine who will emerge. 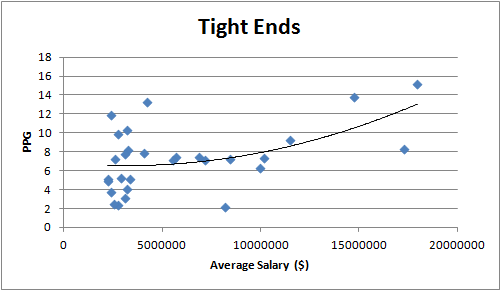 We have a new player atop tight end salaries for the first time in recent memory. The dynamic Kelce finished each of the last two seasons as the overall TE1 accumulating 83+ receptions each year. He carries more uncertainty going forward with brand new starting quarterback, Patrick Mahomes, and increased target competition in the form of heavily paid Sammy Watkins. No tight end provides the kind of advantage Gronkowski does on a weekly basis. 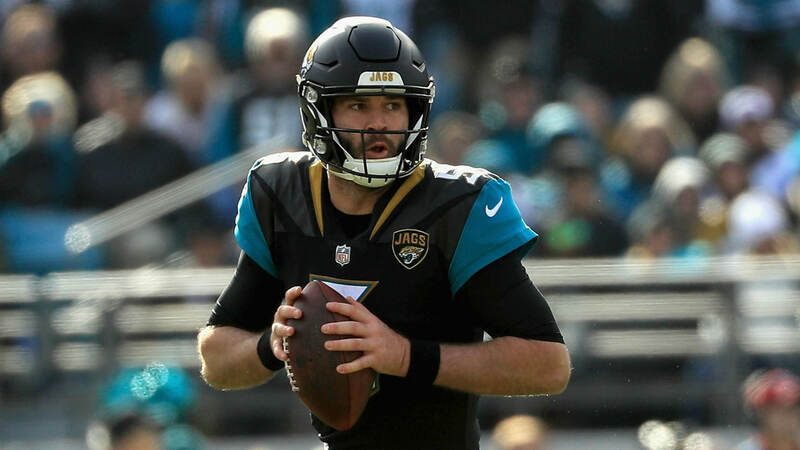 He possesses ridiculous yardage and touchdown upside from being tied to one of the best quarterbacks of all time and atypical usage with deep targets abound. The entertaining “Gronk” has not closed a season outside the top-8 in points per game since his rookie season and only once during that time has he not ended as the overall TE1 or TE2 in PPG. Health remains the primary concern for someone who has not played a full 16 games in the last 6 seasons. The model of consistency award goes to Philadelphia Eagle Zach Ertz who comes at a discount compared to the top two tight ends but without their upside. His receptions ranged from 74 to 78 over the last three seasons while his yardage spanned from 816 to 853. The touchdowns spiked in 2017 doubling his previous high to eight resulting in the TE3 scorer. He is a candidate for negative touchdown regression correspondingly with his third year signal caller Carson Wentz. Engram produced one of the top fantasy seasons from a rookie tight end thanks in part to a rash of injuries to Giants’ receivers. Volume likely drops significantly in 2018 with the return of Beckham and a more balanced offense including top pick Saquon Barkley. Engram should see a spike in efficiency to counterbalance the reduced volume. Offensive line deficiencies forced Engram to lineup as an inline tight end nearly 70% of the time and reduced his receiving usage to primarily low depth of target opportunities. Offensive line upgrades this offseason should allow deeper routes and more usage at his natural move tight end spot where his ridiculous 4.4 forty speed and dynamic receiving skills can be better put to use. Foot injuries doomed Olsen to his worst season as pro in 2017 but previously he posted three consecutive 1,000 yard seasons. A lot of changes occurred in the offseason with new offensive coordinator Norv Turner and the addition of 1st round wide receiver D.J. Moore plus the return of last year’s second round pick Curtis Samuel. We have also seen time and time again how foot injuries linger contributing to other lower body problems and late-career (Olsen is 33) injuries are especially difficult to come back from. Graham is not the same dynamic player he once was thanks to a serious knee injury but any receiver, particularly one with Graham’s receiving skill-set, holds massive touchdown upside in Green Bay. The story for Reed never changes. He remains one of the top options at the position when he plays finishing as the PPR TE1 on a per game basis in 2016 and 2015. Unfortunately he never played a full season in the NFL. Gesicki showed off an amazing athletic profile at the NFL combine and there are a lot of targets up for grabs in Miami. Rookie tight ends rarely do much of anything. Do not get sucked in. The Browns hope last year’s athletic first round pick Njoku makes a big second year leap. He must contend with another athletic player, Seth Devalve, for tight end targets with a low volume passer and a receiving group which added target-hog Jarvis Landry. Rudolf exceeded 532 yards in a season just once while averaging less than 10 yards per reception over his career. The huge tight end holds solid touchdown upside which keeps him the low end TE1 conversation. An ACL tear already ended the season for Henry. He is a strong long-term buy grading out very well his first two seasons in the league. It is conceivable Burton, who Chicago paid a lot of money in free agency, becomes the focal point of an almost completely rebuilt Bears passing attack. The undersized former undrafted free agent might also remain a limited-use niche weapon in the passing game. Walker posted four consecutive 800+ yard seasons while never exceeding 7 touchdowns. Look for mid to low TE1 numbers again on a team without much in receiving weapons. 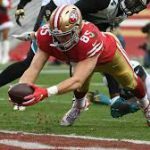 The uber-athletic Kittle represents a cheap option for those looking to get a piece of the Garoppolo-led San Francisco offense on a team without much in redzone targets. He ceded more work to running-mate Garrett Celek in the second half of the season, never seeing above 56% of the snaps in the last eight games. The story of Eifert reads similarly to Reed. He grades out as one of the top all-around tight ends when on the field and an unstoppable force near the endzone. Unfortunately Eifert played just 39 games in his first five seasons and is not yet ready to go for training camp. The Indianapolis tight end battle will be fun to watch with Doyle and Ebron battling for targets and Andrew Luck seemingly set to return. 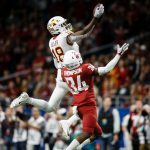 The Colts have practically zero proven receiving talent behind T.Y. 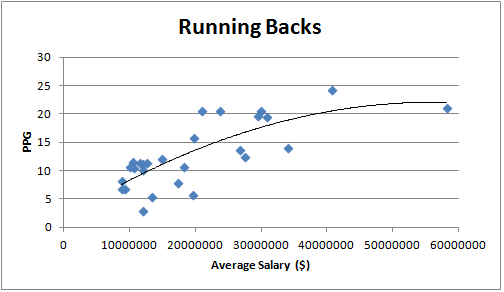 Hilton and Luck has utilized multiple tight ends in the past so both could hold value. Last year’s first tight end drafted, Howard, is likely blocked from big fantasy relevance this season with fellow tight end Brate in the picture and a strong receiving core for Tampa Bay but both tight ends could be stream-worthy. Cook led the Raiders in receiving yards last season and Oakland lost target-hog Michael Crabtree. 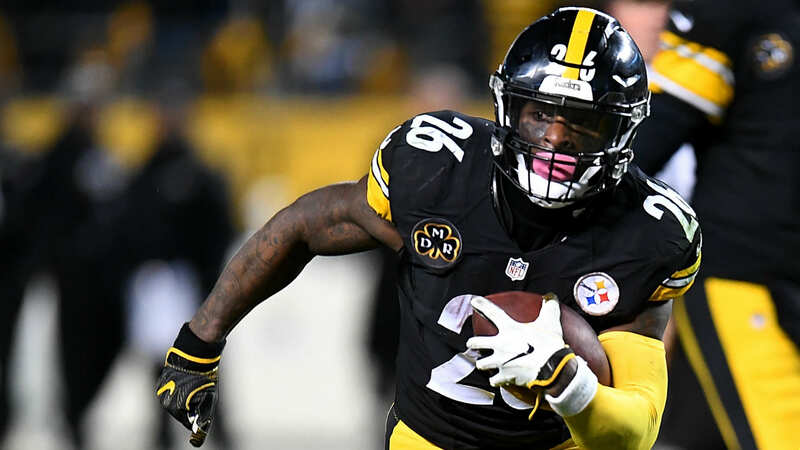 The situation is murky with the addition of Jordy Nelson and Martavis Bryant to go along with a new Jon Gruden offense. McDonald is easily the best receiving tight end in Pittsburgh and got more involved at the end of the year culminating with a 112 yard eruption in the playoffs. Injuries and questionable hands have limited effectiveness over his career. The best receiving option in Buffalo might be Clay who has over 500 yards in five consecutive seasons. 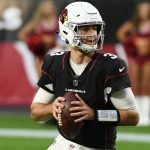 Buffalo could produce the most ineffective offense in the league with a rookie or backup level QB at the helm and Clay has not played a full season in five years. Seals-Jones has a golden opportunity with the Arizona tight end spot up for grabs. Jermaine Gresham is coming off an Achilles tear opening the door. 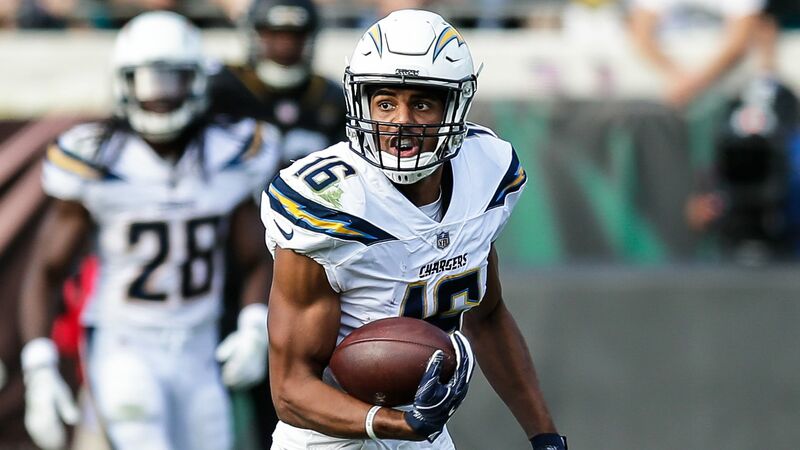 The former wide receiver found some limited receiving success last season but his prospects going forward will largely depend on if he can make himself into a competent blocker which would allow him to stay on the field for more snaps.